The RFQ process for the solar project at the airport finger yielded 29 submissions, 19 met the criteria and were invited to bid, with the project attracting potential bidders from Bermuda, Canada, Spain, USA, Germany, UK and Australia. This was stated by the Minister of Economic Development Dr Grant Gibbons in the House of Assembly today [Feb 3], who explained, “The Request for Proposal [‘RFP’] for this project was issued on Friday, December 2nd. “I am happy to report that the project is well under way with the achievement of this milestone. This project is a joint effort between the Ministry of Public Works and the Ministry of Economic Development, with assistance from the consulting firm of Castalia Strategic Advisors,” the Minister said. “Project oversight is provided by a Steering Committee, comprised of the Permanent Secretaries of the Ministries of Public Works, Economic Development, Tourism, Transport and Municipalities and the Financial Secretary. “The issuance of the Request for Proposal was preceded by a Request for Qualifications [‘RFQ’] that was published in August of last year. The RFQ was designed to ensure that only those companies that met the qualifying standards would be eligible to participate in the bidding process. “These standards included a demonstrated financial capacity to build and operate a Solar PV facility of this scale, and an established track record of operating efficiency and reliability. “In other words, Mr. Speaker, a respondent who had never developed or operated a Solar PV facility of the requisite size could not qualify. “The RFQ process yielded 29 submissions, one of which was disqualified due to a late submission, leaving 28 to be evaluated. Of the 28, 19 fully met the pass/fail criteria and were therefore issued with an RFP and invited to bid on the project. “This project has attracted international attention, with potential bidders from Bermuda, Canada, Spain, the United States, Germany, the United Kingdom, and Australia. Mr. Speaker, following upon the statement I provided in July of last year, I am pleased to provide this Honourable House with an update on the 6 Mega Watt [‘MW’] utility-scale Solar Photovoltaic [‘PV’] Project on the ‘Finger’ at the LF Wade International Airport. The Request for Proposal [‘RFP’] for this project was issued on Friday, December 2nd. Mr. Speaker, Honourable Members will recall that this project is a Throne Speech initiative first announced in 2015. I am happy to report that the project is well under way with the achievement of this milestone. This project is a joint effort between the Ministry of Public Works and the Ministry of Economic Development, with assistance from the consulting firm of Castalia Strategic Advisors. Project oversight is provided by a Steering Committee, comprised of the Permanent Secretaries of the Ministries of Public Works, Economic Development, Tourism, Transport and Municipalities and the Financial Secretary. Mr. Speaker, the issuance of the Request for Proposal was preceded by a Request for Qualifications [‘RFQ’] that was published in August of last year. The RFQ was designed to ensure that only those companies that met the qualifying standards would be eligible to participate in the bidding process. These standards included a demonstrated financial capacity to build and operate a Solar PV facility of this scale, and an established track record of operating efficiency and reliability. In other words, Mr. Speaker, a respondent who had never developed or operated a Solar PV facility of the requisite size could not qualify. The RFQ process yielded 29 submissions, one of which was disqualified due to a late submission, leaving 28 to be evaluated. Of the 28, 19 fully met the pass/fail criteria and were therefore issued with an RFP and invited to bid on the project. 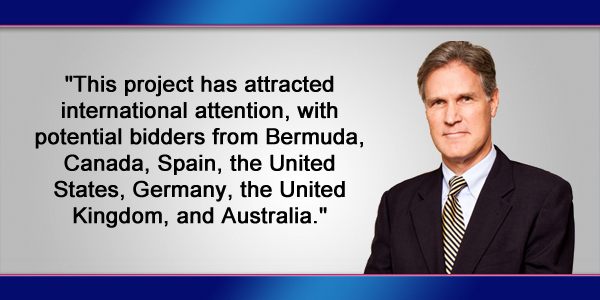 Mr. Speaker, this project has attracted international attention, with potential bidders from Bermuda, Canada, Spain, the United States, Germany, the United Kingdom, and Australia. As would be expected, the project team has conducted this project according to established international ‘best practice’ standards to ensure that every aspects of the project is conducted in an open, fair and transparent manner. Mr. Speaker, one of the objectives of this project is to provide pricing stability for a portion of Bermuda’s electricity supply by ensuring that the price remains fixed over time. The cost of electricity generated by solar power is not subject to price fluctuations; therefore this cost can be contractually fixed over the twenty-year anticipated life of the facility. Other objectives of this project include; the diversification of the energy supply, and the reduction in Bermuda’s carbon emissions, which could avoid as much as four thousand [4,000] metric tons of carbon emissions per year of operation. Mr. Speaker, the bid factor for the proposals is the fixed price previously mentioned and is based upon the bid price for a kilowatt-hour. This will be a principle factor in selecting the successful candidate. Also, to ensure that each bidder is able to offer a price that is based primarily upon those factors that are within their direct control, the Government has decided to ensure that two specific variables of a typical bidder’s pricing model are pre-defined. These variables are the cost of site-preparation and the rental cost for the property. The Government will therefore prepare the site at its expense, to be recovered from the rental income for the approximate 15 acres that will be leased to the developer. The Government will also indemnify the successful bidder against any pre-existing environmental conditions that may be found during works required to develop the facility. The bidders can therefore eliminate the site-preparation costs from their models and add the rental costs that will be set by the Minister of Public Works. Mr. Speaker, the Request for Proposals that were issued during the early part of December specified an initial response date of January 31st. However after several requests from prospective bidders and the need for the Project team to provide additional information, the Steering Committee authorized an extension to the second week of March. The project team therefore estimates that they will be in a position to recommend the successful candidate by early April. Mr. Speaker, the procurement phase of this project is the culmination of a year of preparatory work, having addressed matters that range from environmental fatal flaws to infrastructure constraints. This project will be a model for the procurement of other utility-scale energy projects by having created a comprehensive suite of documents, which cover all known elements of a project of this nature. Finally Mr. Speaker, this project is only the first phase of the use of the Finger for Solar PV power. A second project on the Finger will be considered once BELCo infrastructure upgrades are scheduled and completed for the East End. In the interim Mr. Speaker, I will continue to provide this Honourable House will periodic updates on this initial project as it progresses. Why can’t we just keep it among our Bermudian Companies and contractors. Come on OBA, why even explore that overseas? Keep this project at home, and employ Bermudians. You guys talk out of both sides of your mouth. Remember, BERMUDIANS AND BERMUDIAN COMPANIES FIRST. If the Bermudian bid is decent (not necessarily the best) then by all means give them the opportunity. At least this way there will be a way to compare with expd competition. If only Bermudian companies would be able to bid, then it would be more expensive as they would charge what they want. Like this they have competition and have to price it right. Bermudians should still get it, it is a big project and the workload could be split by different companies. Because it is a very limited number of locals that can come close to meeting all the qualifications. This isn’t somebody’s house or business roof, this is a commercial production facility that will have to be regulated into the local grid. The statement also highlights local companies are involved in the RFP. Remember, Bermudians and Bermudian companies first, is not synonymous with what is best for Bermudians and Bermuda. Entitlement is the destroyer of cultures and civilizations. It’s a project that will be producing power for decades. If one is even marginally less efficient than another, the cost over time will be huge. It is essential wecget the best there is. Unlike, say, if a statue were commissioned by an overseas artist rather than a Bermudian one. That has only a one-time effect. they ask for RFP for this project but not the airport. SMH. We wouldn’t understand, but maybe Bob can explain : “Now, there’s been a lot of talk about RFP. RFP stands for Request For Proposal. To use an RFP process is the traditional, if you like, normal procedure that is used by the Government of Bermuda to decide who will build, who will do any contract. In other words, putting it out to tender. Will this project use a traditional RFP process? The answer is no. Let’s look at the purpose of an RFP process. No wonder Bermuda is so messed up. Before the RFP you have the RFQ, no Bermudian company would pass the RFQ as no one is qualified. Do you really want the new airport as a test dummy?? So you like and support the way this is being done then.